www.VIGILANCEVOICE.com Prayer Sept. 30 "370 Pounds of Souls..."
It is Sunday...for many here in Manhattan, it is a time of reflection. Church bells ring. They sound sad. Lonely. Smoke still wafts up from the bowels of the World Trade Center...where fires...like those of Dante's Hell…burn the viscera of the destroyed buildings...an ominous reminder that the candle of Terrorism smolders...that it doesn't die. A few months ago I read something about the souls of the departed. A group of researchers measured the weight of a dying person. After their last breath, they measured the body’s weight again. They performed this research countless times with terminal people. They found a weight difference of 27 grams between a person who was alive one minute, and dead the next. Seeking answers to the phenomena of "where the 27 grams of weight went" upon the passing of life, some speculated that the 27 grams is the weight of a person's soul. I began to calculate. There are about 28 grams in an ounce. And 16 ounces in a pound. If there were 6,000 plus dead at the World Trade Center, the weight of their souls would be over 370 pounds. I mean no offense to any to any of the souls who died in the World Trade Center holocaust. I have a very sound reason for converting the death of those into a measure of gravity. I hope you will agree with it—or its principle. Inside me is a child who lost his father. I know the pain of wishing the return of the life that was deprived me as a young boy. I know so many children secretly deny the deaths of their parent or parents, of their uncles and aunts, of their grandparents, or friends. Especially when so many have gone unidentified. There is that slim thread of Hope we all want to cling to, to grasp hold of so our hearts will not harden, and the pain will not live forever that “he” or “she” is gone forever. Forever is too long. That’s why I converted the 27 grams to the weight of those who died into pounds. The child in me wants to deny their death, to make sense out of the senseless destruction of life. So I have converted the 370 pounds of souls into a giant Spartan of Vigilance, standing 8.48 feet tall. The height represents the time the first plane crashed into the World Trade Center, 8:48 a.m, September 11. My Spartan of Vigilance is a combination of men and women of all different colors and shapes and sizes. She/He is able to speak many languages, enjoy many cultures, and vast spiritual beliefs that all point to one power greater than themselves. The statue of my Spartan stands back-to-back, the man and woman, joined as one, their eyes searching the sky, the horizon. In the woman's right hand she holds a wreath, and olive branch, up. She has a sword on her hip, and her hand is on the hilt, ready to fight for the safety of the children who surround the base of the statue. The man, blended with her in metal so they form one body, joined as one from the lower torso, holds a wreath also in his left hand, and his righ hand is poised over the hilt of his sword. From the tops of their heads burns an eternal flame, igniting the night, casting away the shadows of Fear. The symbols of Peace and Readiness of the Sentinels seeks the good rather than the bad, and teaches peace rather than war. But He/She is ferocious about defending the children and innocent from harm--willing to give Her/His life toward the protection of the innocent without a moment’s hesitation—just as the firemen and police and emergency medical teams who rushed up the stairs of the crumbling building, fearless of their mortality. When I look downtown, toward the smoldering mass of twisted metal and rubble, I don’t see the Twin Towers, but in their place, I do see the three-hundred and seventy-pound Spartan of Vigilance towering over the Fear, the Complacency, the Sorrow, the Pain, the Anguish, the Intimidation, the Anger, the Hate the Terrorist left to eat at the souls of the living. If I listen closely, I can hear their soothing Voices, quieting the secret fear that runs through the hearts of the innocent children. She/He’s Voice reminds them their loved ones are here--not gone--not swept away in the dust and debris of construction trucks hauling chunks of concrete and metal from the WTC site. He/She tells the children those who died are not just a memory, they not buried deep in the cold, lifeless ground with all the things that hide beneath the surface. Instead, the Spartan of Vigilance tells the children that their spirits walk with them to school…they help them cross the streets…they sit by their bedsides holding their hands when the wind howls and the rain hammers at the windows and the sky ignites with scary flashes and thunder rumbles like a dragon's roar in the fright of night. He/She tells the children not to be afraid. They are here to comfort them when they are sad, or lonely, or feel the Terror or Fear of life itself battering at them. The three-hundred and seventy-pound, eight-point-four-eight-inch Spartan of Children’s Terrorized Souls, takes any child’s hand and walks with him or her through life, showing each that Fear is the absence of Faith, and that belief in something larger than their Fears, or Apprehensions, or Self-Doubts protects them from all harm inside their hearts. This belief in the Vigilance of Faith in the future, the Spartan reminds, is something no Terrorist can ever take away from them. Faith in the future is the treasure left in the rubble. The Spartan remind the children they must cling to the belief there is at least One Percent more good than bad in all people, but that some people forget this, as did the Terrorists that day. When they cross the line between the good and bad within, they act in selfish, harmful ways. Sometimes they take the lives of the innocent, as they did that day. She/He tells the children they must not Hate, or Fear, or harden their hearts—for that is what the Terrorists want them to do. Terrorism wants them to be afraid, to deny their innocence, to kill their belief in the overall good of others, to drive them away from a belief in God, a belief in Justice, and a belief their mother or father or loved one died for a reason. They tell the children the Terrorists don't want them to think of their loved one as a Sentinel of Vigilance, but rather as a "victim of a tragedy." They remind the child Terrorism feeds on its victim's pain and suffering. And to feel sad or hurt or angry at them only makes them bigger, uglier. The Spartan tells the children good will trumpet over bad. It always has. It always will. But for that to happen, the children must believe in the sunlight of the Spirit...in the beauty of the sky itself...and that beyond all the dark and painful clouds that hang over Manhattan, over the Pentagon, over a lonely farmer’s field in Pennsylvania, over the entire nation and world…the sun and moon always shines brightly just behind the clouds. This light, He/She says, offers the children a flashlight to see through the darkness of all pain and suffering...through all grief. The Spartan tells the children She/He will be with them always, to remind them to shine the light of Faith on the darkness of Fear. And that He/She will protect them so they will never be alone, for they are the sum of their loved ones--standing vigil over their future. When I look downtown, I see this Giant Spartan of Vigilance. I believe, as the child, that She/He exists to protect my children, my grandchildren, and their children’s children, and all children of all ages, everywhere in the world. And I believe that protection includes me, an older man with a child still inside me, wanting to believe I am not alone in my hidden Fears, my hidden Pain. And that child in me wants to believe that on September 11, those who died were reborn an instant later. I want to believe those who perished in fiery destruction of a Terrorist blow to Peace and Freedom, transformed at the moment of death into an eight-point-four-eight foot high, three-hundred and seventy-pound Spartan of Vigilance. My child wants to also believe this Giant of Faith is a composition of all the departed souls who returned to us that instant so we would know they did not die in vain, that they weren’t “victims of a tragedy,” but rather transformed into glorious “Sentienals of Peace.” The child in me needs to believe the Spartan walks beside me, whispering in my ear: “Vigilance, Cliff, Vigilance." 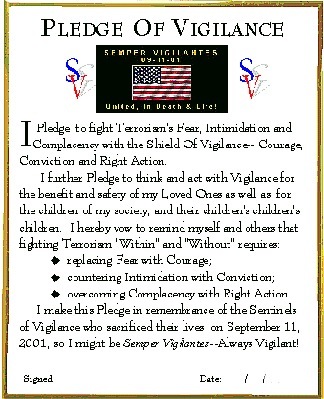 I believe the souls of the Spartan of Vigilance lives on to help us fight Terrorism. It gives me a reason "why" they died, and takes away the questions of a senseless act of destruction and converts it into a meaningful moment in human history--one that can live forever in children's minds. So I offer this prayer to all the souls of the Sentinel of Vigilance who stands in readiness to protect those of us who are left on this earth. I am one of your many children of belief, believing in your presence, and trusting in your guidance. Cliff, the Child, Cliff the Man. Go To: "Prayer For The Day"